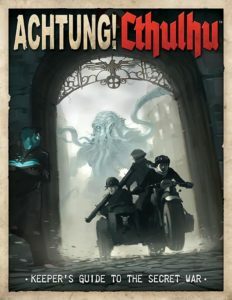 You know, I always liked the cover to Modiphius’ Achtung! Cthulhu: Keeper’s Guide to the Secret War. Why? Because our heroes are fleeing. It’s also World War 2, and there’s action happening! Behind enemy lines! It looks so good, and I particularly don’t care for Cthulhu, Lovecraft, or the Mythos. 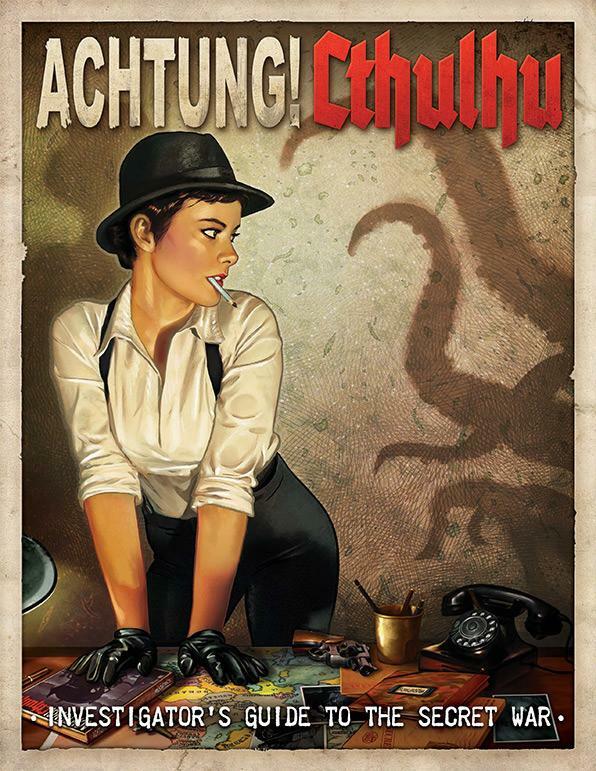 But if I were to play in any Cthulhuesque game, that cover makes me want to try that one. I also love the title of the game: ACHTUNG! CTHULHU! I can’t say the same for the Investigator’s Guide, which doesn’t really have any action and has a female protagonist in a sexualized pose. I mean, it’s a wonderfully-illustrated cover — I love the shadows and wall texture — and if I were in the market for a pin-up Mythos calendar with Good Girl Art, I’d say hello, Miss January! But it doesn’t capture what I think this game — or any game about Cthulhu — is about. Achtung! Edit: Not less than ten minutes after I posted this, Modiphius announced the Achtung! Cthulhu Living Campaign, along with up to 70% off of A!C product. Last year, I wrote about how I don’t play games when I’m at a gaming convention. That has changed a bit since I’ve been more successful in the gaming industry. This year was the first I’ve been to conventions where the primary goal wasn’t networking, but actually enjoying myself. In two weeks, I’ll be at Gen Con where, unfortunately, I am not scheduled for any games — the company I am going with seemed to have had a snafu with my badge, associating it with my Gen Con account last week instead of earlier. End result: nearly everything is full. There is one game that starts as soon as the exhibit hall is closed one day I’m there until closing, but it’s over in the Lucas Oil Stadium, which is at least a twenty minute walk from our booth. I do have some generic tickets waiting for me at Will Call, so I’ll see if I can pick those up after I check into the hotel on Wednesday and spend them at Games on Demand, which is a much more flexible gaming option. In 2015, the topic was “Most Recent RPG Purchase”, which acts oddly in these posts. In 2014, it was Day 4’s topic. In 2015, it was Day 5’s. I haven’t purchased anything gaming-related since I wrote the last #RPGaDAY post, so there’s some navigation below if you’d like to be surprised at my answer. In 2014, the topic was “Most Old School RPG Owned”, and I still love that post. Spoiler: It’s Shadowrun‘s fifth edition. When I revisited this last year, I was looking forward to Shadowrun: Anarchy and The Sprawl, two faster-playing Shadowrun-esque games that use roleplaying techniques and design sensibilities from a time later than the early 1990s. “It’s going to be a race to see if [Shadowrun: Anarchy] comes out before The Sprawl‘s “Touched” setting is finished,” I wrote. Oh, ha! Touched is still in development and I am thinking it may show up by year’s end. Still travelling/vacationing, so I might catch up to today’s topic later. Or I might wind up doing a whole bunch of catch-up posts later this week.